The Oak View Group is close to naming a contractor for the project and has revised its cost estimate to $700 million. Under an MOU and a development agreement, OVG would be responsible for the entire cost of the renovation, including overruns. 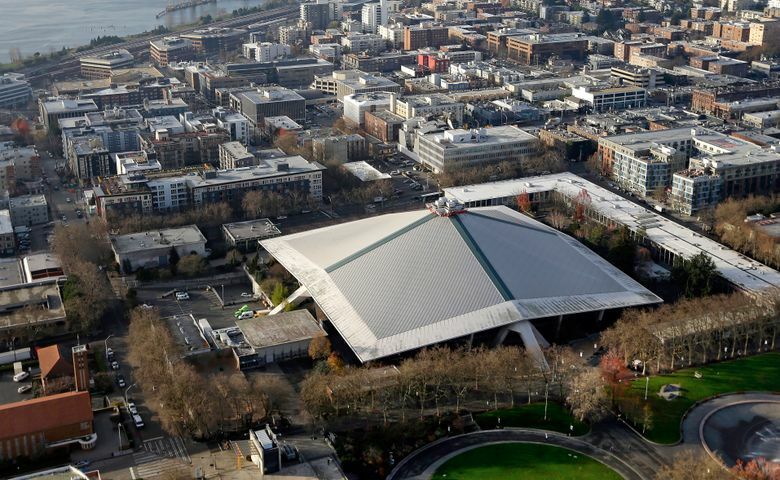 The renovation of KeyArena could begin as early as October, and its expected cost is now $700 million, the Seattle City Council heard Thursday. That’s $100 million more than the budget was in December, when the council and Mayor Jenny Durkan approved a Memorandum of Understanding (MOU) with the Los Angeles-based Oak View Group (OVG) for the massive project, which could attract an NHL team soon and possibly an NBA team down the road. But the city won’t be on the hook for the increase from $600 million, said Marshall Foster, director of the Seattle Office of the Waterfront and Civic Projects. Under the MOU and under a development agreement scheduled for a vote by the council in September, OVG would be responsible for the entire cost of the renovation of the city-owned arena, including the recent increase and any additional overruns, he said. OVG is close to naming a contractor for the project and has revised its budget estimate based on talks with that contractor, Foster said. Representatives for OVG confirmed the cost increase and that the contractor announcement is coming soon. The group led by pro-sports executive Tim Leiweke plans to use both private equity and debt financing for the renovation in general and to cover the $100 million increase, Foster said, briefing the council’s Select Committee on Civic Arenas on the project’s status. An independent adviser is vetting OVG’s plan for the city, he said. The project’s cost has grown for various reasons, including changes in the construction market and OVG deciding to adopt a pricey approach to the work that could minimize impacts to the neighborhood, Foster said. Rather than dig a cut-and-cover tunnel under Thomas Street, OVG now intends to mine the tunnel, he said. “They also have a really interesting way to stabilize and protect the roof that’s going to help them speed up the whole excavation,” Foster added. The project could begin as soon as October, according to a city timeline that calls for the council to vote Sept. 17 on agreements to cover the arena’s development, lease and integration with the rest of Seattle Center. OVG has pledged $40 million toward a city fund to mitigate transportation problems in the neighborhood and $20 million for local charities, including $10 million for YouthCare, a nonprofit that serves homeless youth. Further community benefits will be included in the development, lease and integration agreements, the council heard Thursday, including money for public art, construction mitigation and relocation assistance for some Seattle Center tenants. The city has zeroed in on a new site for the center’s skate park, which will need to make way for the renovation, Foster said. A new park likely will be built along Broad Street between Denny Way and Fifth Avenue North. Negotiations over the agreements with OVG are ongoing, and an environmental review is due Aug. 30. During a public-comment period Thursday, several speakers urged the council to make sure that review and the resulting transportation plan for the new arena prioritize walking, biking and transit rather than cars. The council committee approved landmark controls and incentives for KeyArena’s roof and for the Bressi Garage building that houses Pottery Northwest. The ceramics space should be able to remain in place during the arena’s renovation, Foster said. Assuming the council approves the agreements on schedule, KeyArena would host an NBA preseason game Oct. 5 and be turned over to OVG Oct. 15.